Listen to classical music in stunning HD audio on your Android device, iPhone or iPad. Carry the world's greatest music with you 24/7 with the official Classic FM app. We've made it easier than ever to listen to our mix of uplifting and relaxing classical music. Plus, be the first to see exclusive music videos, features and quizzes. 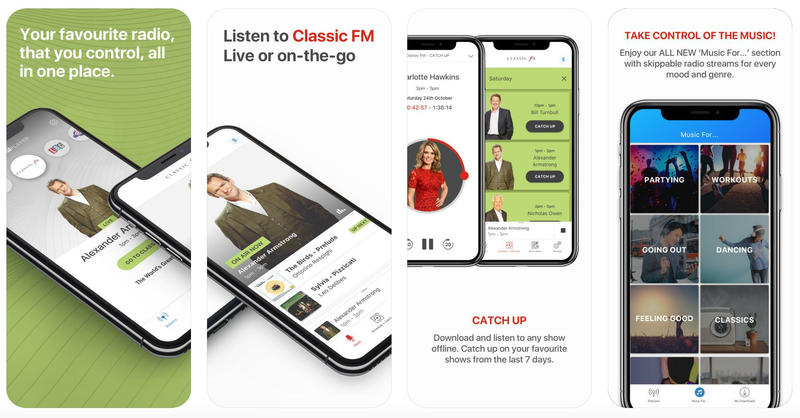 With the new Classic FM App powered by Global Player we've made it easier than ever to listen to The World's Greatest Music. - Listen to Classic FM in HD quality, live and on the move. - Enjoy shows with fantastic hosts like John Suchet, Myleene Klass and Alexander Armstrong. - Catch up / listen again to all your favourite shows whenever you like. - Download and listen to shows offline, perfect for listening while you're travelling. - Subscribe to your favourite shows to automatically download them each day. - Check the playlist for music info and show schedules to see what's coming up next. - Get the latest artist news and features. With the Classic FM app you can also enjoy all of Global's other stations: Capital, Capital XTRA, Heart, LBC, Radio X, Smooth and Gold. Hear the best shows from the biggest names in radio: Myleene Klass, Chris Moyles, Johnny Vaughan, Roman Kemp, Nick Ferrari, James O'Brien and many more. Listen to all of Global's stations in HD audio. Get the latest news, videos and pictures from each of Global's stations with the best guests and most entertaining, informative content. If you want to relax or exercise, choose 'Music For…' and we'll serve you the best music for your mood. You can also skip tracks in this section*, so now you're in control of what you hear. See what other people are loving with our top trending shows. *Currently only available in the UK.